For over 10 years, BlueSky Personnel Solutions has specialized in helping organizations with hiring bilingual candidates. In Canada’s business landscape, especially for companies that service clients or customers in Quebec, having employees who can service customers in both official languages is a business imperative. Having bilingual employees gives companies a competitive advantage too – often referred to as the two for one deal for those with a light-hearted sense of humour! But if hiring managers are not fluent in both English and French themselves, it can be tricky for them to assess the fluency of a candidate applying for a bilingual position. Speaking French fluently may not be enough in certain circumstances – to properly service francophone customers. 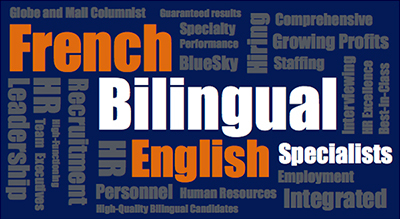 For some bilingual job positions, candidates must be fluent in both verbal and written communication, and have the vocabulary, knowledge of grammar, syntax and verb conjugation to conduct articulate business conversations in French. description is as specific as possible: e.g. are bilingual abilities a plus, are they preferred, is the candidate only required to speak French fluently, or are both English and French skills in a written and verbal capacity a must? 2. If bilingual capabilities are critical to the job, ensure this assessment is done during the initial phone screening if possible, so internal resources can focus only on the best-qualified candidates. the candidate’s full language capabilities. Some employers also consider language proficiency assessments, especially if the job requires a mastery of technical terms or industry jargon.